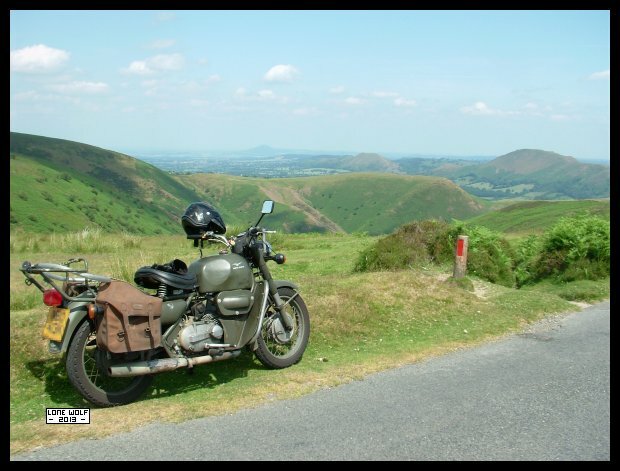 The Guzzi sitting atop the Long Mynd on one of the hottest days of the year so far. Tuesday saw me taking the Bullet over to City Hospital for an insurance based medical examination. Wednesday and I never even bothered with unlocking the door - this leg gives me days like that every now and again. Friday and it was time for my annual eye examination - time for new spectacles I'm afraid. Saturday and it was just too hot to do anything - I spent all day just riding around on the Guzzi looking for somewhere cool. Sunday - the classic bike show at Mill Meece, followed by a visit to Foxfield Railway and Blithfiled Reservoir for ice cream on the way home.